The SWF export supports both bitmap effects (which can be previewed in Render View mode) and SWF Blend Modes (vector effects which can be previewed in OpenGL View mode). • Pencil line thickness: They are converted to brush strokes in the SWF file. • Auto Patch module for creating joint patches. If you have not already done so, you should preview the SWF by using the SWF preview button to see what the two types of effects look like when blended together. Once you are satisfied with the results, go ahead and export your movie. 5. 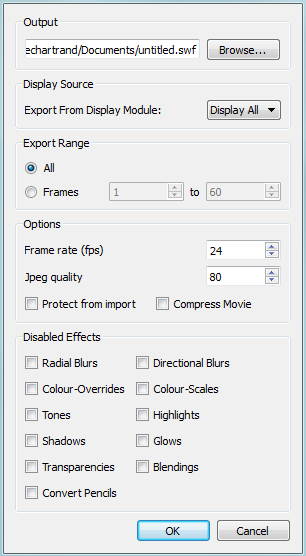 In the Options section, enter your Frames rate (fps) into the field provided. By default, it will be set to match the fps of your Harmony project. If you choose a lower frame rate, your export playback will be faster than your actual project. The reverse is also true for a higher frame rate. Note that certain Harmony effects will not be listed in this section as they are not vector-based and therefore not available for SWF export. These effects will not appear in the SWF render.